Alexander Borodko describes his five-step technique for non-surgical facelifting using a combination of hyaluronic acid fillers. Effective modern aesthetic medicine involves synergistic treatments by both the plastic surgeon and cosmetologist. 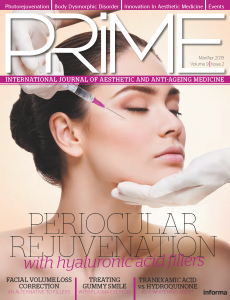 Innovations in the field of injection cosmetology can significantly postpone surgical intervention and achieve good aesthetic results even with difficult patients. I would like to take this opportunity to share my experience of non-surgical facelifting. To begin with, I would like to present a facelift technique using hyaluronic acid fillers for the correction of the periorbital area and midface. Facelifts are still a pressing issue despite the huge number of methodologies and algorithms proposed by experts over the past few years. The subject continues to draw a lot of attention due to the fact that the correction of this facial area allows, in most cases, the practitioner to achieve significant aesthetic results with little to no unnatural appearing side-effects. However, the reverse side of the coin is still the complexity of approaches in correcting this area and its anatomical peculiarities, making it possible only for a specialist with a high level of knowledge in topographic anatomy to safely carry out the procedure. Of course, it is impossible to separate the ageing of the mid face and the periorbital area from the general process of facial ageing. For instance, take the atrophic and hypertrophic processes in the buccal fat pads, changing of turgor and tone in the muscles and ligaments, the effect of gravitational ptosis, dystrophy of craniofacial skeleton, and symptoms of depletion of skin resources. First, practitioners should keep in mind the peculiarities of all these processes and perform the correction based on the principles of countering ‘ageing vectors’ and the ‘compensation strategy’. A detailed description of ageing processes would probably prevent from focusing on the subject of the article, so I venture to concentrate on basic points. ONE: Ageing of the periorbital area is more often associated with a dystrophic effect upon the orbital rim. With age, the upper-medial section of the upper orbit and the lower-lateral section of the lower orbit part are subject to progressive resorption. These symptoms are the basis for intensification of gravitational ptosis and these processes relate to a worsening state of the upper eyelid, the hernia sacs, and the subcutaneous fat pads. 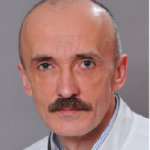 TWO: Many authors, such as Patrick Trévidic, Hervé Raspaldo, and Fahd Benslimane have previously described the changes the upper orbital lateral fat pad undergoes beneath the eyebrow tail. Tomographic studies suggest restructuring changes, such as hyperextension of the septa, loosening and atrophy of the adipose tissue, and its displacement and ‘spreading’ under the tissues, so it ceases to play the role of a ‘cushion’ supporting the eyebrow tail. THREE: Displacement of the malar fat pad and changes to its structure lead to a number of consequences, including exposure of the orbital rim, visible under the thin skin with dilated veins of sub-orbital venous plexus. This creates the effect of the ‘dark circle’, a V-shaped groove of infraorbital fossa, a growing retraction in the orbital maxillary area, and a worsening of the state of the nasolabial fold. FOUR: The orbicularis oculi muscle in young people is positioned from the medial low orbital edge and forms a toned muscular sphincter around the eye socket. Age-related loss of muscle tone is also characterized by hypotrophy and ptosis. The excess lower portion of the orbicularis oculi muscle also affects the formation of ‘malar fat pads’ and the general worsening in the state of the lower orbital area. In general, the age-related hypertonia of a number of muscles is bound to be compensated. As a result, we observe a worsening of facial wrinkles. However, the correction of muscle hypertonia will be discussed in the section devoted to face lifting with the help of botulinum toxins. ubject to ptosis as well as other formations. With it sinking, together with the eyeball, to the bottom of the bone orbit, it exacerbates the protrusion of extraconusal fat, thus leading to the appearance of hernia development in the lower eyelid. 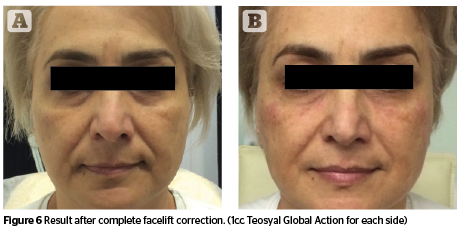 The author’s supraperiosteal treatment method for non-surgical face lifting was developed in order to make injections for aesthetic corrections possible for patients with turgor pressure and an overall tired appearance, while abstaining from surgery intervention for as long as possible. A combination of hyaluronic acid fillers is applied. For the periorbital area — high plastic, low-hygroscopic fillers, or those specifically designed for this area are used, as well as preparations of medium and high density, which are viscoelastic and form-building. This includes assessment of tissue state and examination by palpation. Appraisal of relevance of using non-surgical methods of correction. Determine the anatomical structures of the upper edge of the orbit, and then determine the location to inject the bulla. Use your free hand to raise the eyebrow tail, along with substructure tissue, up and outward. Introduce a needle to the lateral part of the incisura supraorbitalis, parallel to the bottom contour of the eyebrow, stop the needle tip at the periorbita where the bulla will be placed. 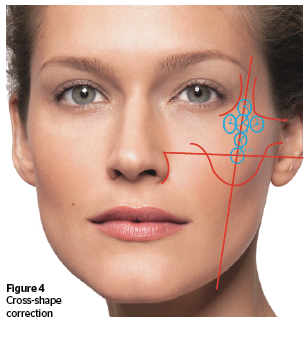 Place a hyaluronic drop 0.3–0.2 ml in volume (Figure 1), and then release tissues. Distribute the tight bulla, not dissolved in the tissues, with strong smoothing movements along the periorbita from the eyebrow edge up and outwards along the temporal line. The result of a properly performed procedure will be significant lifting of the eyebrow tail. Average density preparations are used for correction. In my practice, I came to the conclusion that it is impossible to unify the injecting technique up to any standard points or reduce their number to a single square amount. 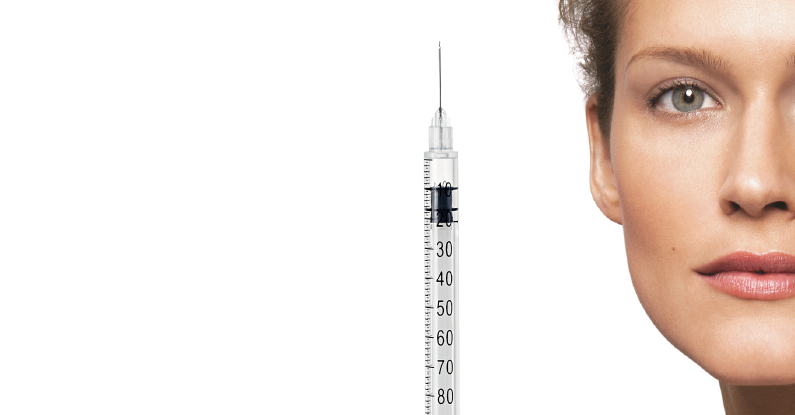 Individual characteristics of a person’s face and the types of ageing they are experiencing dictates the desired volume and places of injection. First of all, you should resort to the principle of ‘safe zones’ (of course, it is not allowed to inject the preparation over Fossa canina, for example), and predict the result of injection. The easiest and best prognostic test is when we can model the result of injection by lifting ptotic zones with a finger. Anatom ical security landmarks are two vertical lines, one of which passes through the mid-pupillary line and another through the medial canthus of the eye (Figure 2); by performing correction within these limits without going beyond the bony orbital margin, we do not run the risk of causing serious damage to anatomical structures. The maximum possible trauma is superficial subcutaneous veins. In the case of bleeding, the vein should be squeezed for 3–4 minutes. For security purposes, I use a 12 mm, 30 G needle, which is applied mesad and parallel to the orbital margin, therefore reaching the periosteum. 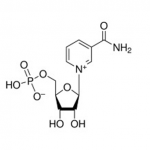 We create a bolus of usually 0.3–0.4 ml in size. The non-floating position of the bolus after injection acts as a test of the accuracy for the performed injection. Spread the preparation with strong smoothing movements along the periosteum lateral direction; the forefinger should fix the orbital margin to prevent displacement of preparation inside the orbit. If necessary, additional injections may be applied along the area of tissue depression with the same technique. The main rule of injecting: apply above the periosteal area and control the distribution of preparation along the periosteum (do not spread it behind the orbital margin). Result of the procedure is a relative, though quite effective leveling of the nasolacrimal or nasobuccal depression. Avoid trying to achieve an absolute correction in order to avoid any possible deferred complications and undesirable effects. Compensation for the medial fat compartment must be performed above the fossa canina (location of this anatomical structure is easy to define by palpation — patient feels pain when pressing on n. infraorbitalis). Bulla is applied above the periosteal layer using a strictly perpendicular injection and distributed along the periosteum with gentle smoothing movements in the lateral direction (Figure 3). The safety landmark is still the speculative line passing vertically through the medial canthus of the eye; a. angularis is kept within its borders. An additional security measure is a standard test of possible vessel penetration (reverse stroke of a piston and no blood in the syringe). This is a multi-component technique, when additional bullae are applied individually for each separate case depending on age-related anatomical peculiarities. Correction of the lateral mid face is performed in the same bulla-point technique above the periosteal area along the central axis of zygomatic bone. Define the anatomical landmarks for the first bulla, begin by drawing a speculative straight horizontal line from the top edge of the nose wing to the tragus of an ear (Figure 4). The second speculative straight line passes through the jowl (if it is not formed yet, tissues should be stretched down to observe an outlined jowl) and the frontal process of zygomatic bone, so the straight line passes through all lateral tissue fixation points. The first bulla should be formed at the intersection of these two lines; the bolus is created by vertical injection. The second and the third bullae should be injected along this ‘fixation’ line. The average distance between them should be 1 cm from each other. The fourth bulla is located from the right and kept parallel to bulla three, again 1 cm away. This arrangement of bullae resembles a boomerang in shape. Formation of additional bullae is substantiated by reasons set below. 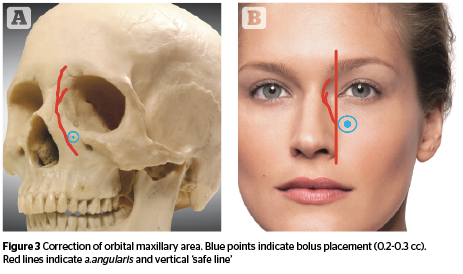 Bulla five helps to smooth out any skeletonization symptoms observed below the orbital margin; it is formed medially on the same line where bullae three and four are located, right under the lower lateral margin of orbit. When injecting, again, one should keep in mind the importance of preparation spreading to avoid it getting behind the orbital margin. The layout of applied bullae resembles a slanted ‘T’. Bulla six is applied for patients with symptoms of malar bags appearance. It lifts and improves the aesthetic results in the periorbital area. Bulla 6 is performed above bulla 3, along the fixation line, and is located in the central part of the malar prominence. The distance between formed bullae in all cases is 1 cm. Thus, the correction scheme has a cross-like shape. 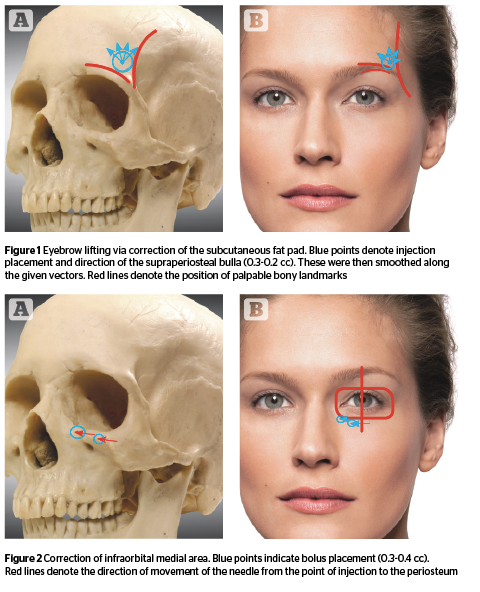 This kind of distribution allows for the building of natural cheekbone area lifting, significantly countering of facial skeletonization, and improvements in the aesthetic appearance. However, it should be mentioned that the application of the ‘boomerang’ scheme (bulla 1–4) is enough for 90% patient cases. We use this method as a complete treatment as well as in its separate parts, depending on the needs of the patient. Patient 1 (Figure 5) 32 year old woman undergoing correction of the periorbital zone. Patient 2 (Figure 6) 63 year old woman undergoing correction of the middle and upper third of the face using the complete facelifting technique. To sum up, I would like state that the facelift technique described above helps to achieve a significant lifting effect through a non-surgical method and is considered to be quite safe and efficient. Aesthetic results may be assessed in most of the cases as highly satisfactory. 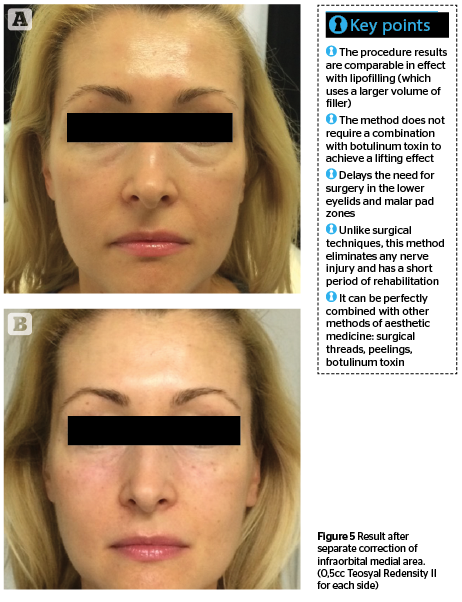 Combination of this technique with lifting methodologies of injecting botulinum toxin further enhances results.